When they came here it was very cold. I remember mom wanting to go to bed by 4pm just so she could hide under the thick blankets. During those cold days, I had been assuring them that warmth is just around the corner. True enough, soon after, Sydney showed them warmth. Too much warmth actually that no resolutions were to be had especially during bed time because only the lounge has AC. Then they started wishing for cold again. I'd say it's a cycle that we have to endure every year. When they came here, both of my older girls were very shy. They were quiet around their Lolo and Lola although it didn't take much longer until they started getting comfortable. Now as they leave, Daisy is quite vocal about her sorrow. I'm sure Demi is sad too. They have grown accustomed to teasing their Lola, with a little subtlety when it comes to Lolo. The biggest development though is with Darla. She just turned 3 months when they came. They held her and hugged her, and she wouldn't complain whereas now she makes a fuss at every new face she encounters. In between those days they have witnessed how she grew in character, taking in more of the cheeky side her sisters have. They are feeling quite sad now because perhaps, when they meet again someday, it would take time before Darla warms up with them again. Enough sadness though. Despite our inconveniences, Dad and Mom did have a few fun days. There's the trip to Sydney Opera House and Harbour Bridge, a must do for tourists I should say. Also, the trip to Melbourne just the 2 of them via coach. Too daring for them but they managed it so, thumbs up! Several trips to buffets and parties with friends in church. 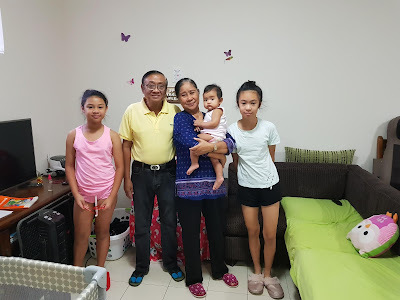 And reunion with Dad's siblings here in Australia.